All I can say is wow, this TAG is super close. I'll preface this by saying that all the games submitted were enjoyable, even the incomplete ones were fun to play, but I've got to choose a winner, so here we go. There were three games that really stood out, for a number of reasons. I'm going to give some of my thoughts and opinions on each game, then at the end i'll announce the winner. The first game to be submitted to the jam makes it into the final three for several reasons. The first and foremost being that, without reading the description given by Mr. Prasad, I knew exactly what sort of personal moment the game was aiming to get across. If you haven't played it, go and play it now (without reading the description in Mr. Prasad) and see if you can identify it too. Done? I was totally serious about you going to play that game. Its awesome. Continue reading when you're done (or if you really can't be bothered). The game very clearly tells a story about learning from your peers, self improvement through sharing of tips and tricks. I think this game had the strongest connection to the Special rule and subsequently I had several "Aha!" moments while playing it. 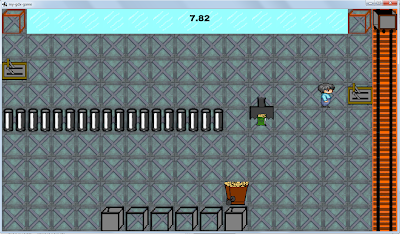 Graphically, it's not bad for a game jam. It also clearly incorporates the themes Squash and Nitrogenize. It does have a few flaws though, the gameplay in itself is simplistic by nature and more curious players will likely discover some of the tips and tricks without having to observe the other workers. I think in order to convey the personal moment so strongly it was necessary to have something simplistic, and the trade-off is apparent. I was really shocked at how big this game was. It's definitely a funky entry. I think the "dreams" come across as "dreams" really well. It may sound strange, but this is actually noteworthy since a lot of the stuff that typically happens in games is wild and outlandish but are distinct from dreams. 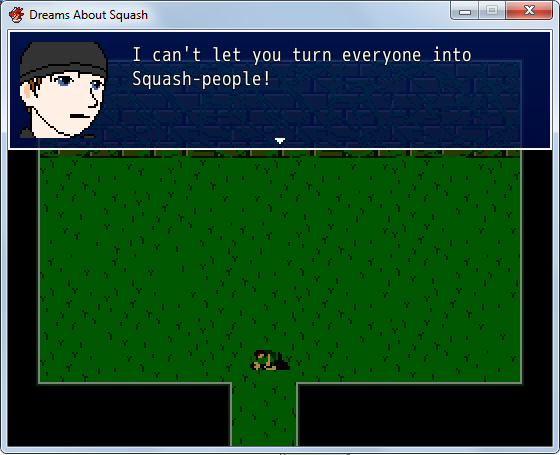 Many of the sequences in Dreams of Squash actually have that "I've totally had that dream before" feeling. The game is funny as well, some of the conversations in game made me chuckle, especially towards the end. 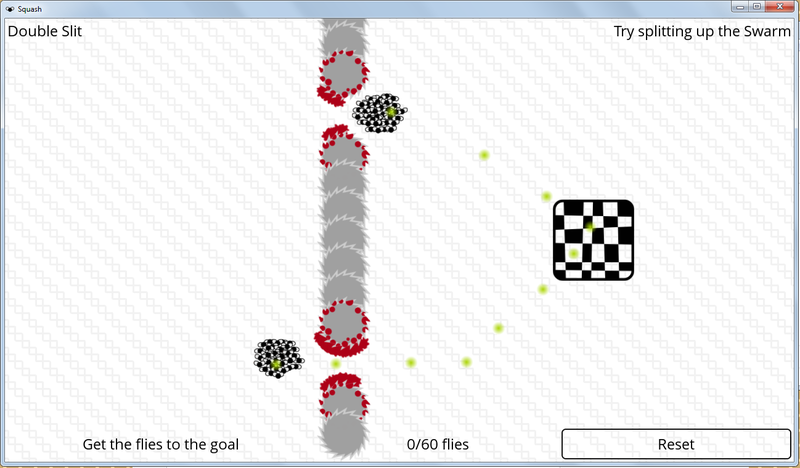 The obvious problem with this game is that there isn't really much "gameplay", strictly speaking. It feels a lot more like an interactive series of cutscenes than a game. Personally, I found it enjoyable, but I feel that this opinion is definitely not going to be universal. These types of games are definitely an acquired taste. In any case, play through it, maybe its right up your alley. I've actually got one other, major, gripe with this game. 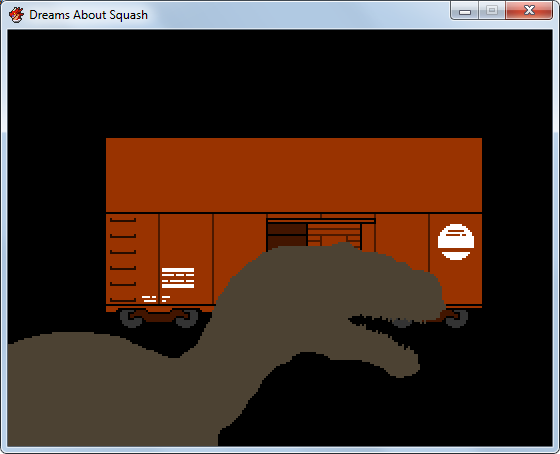 It becomes immediately obvious the moment you start up the game. This fatal flaw is truly gargantuan, monstrous, gut-wrenching-ly horrible. In fact, when I started the game I was physically sick multiple times. I instantly went blind in one eye, my laptop exploded and my house caught fire. This game makes it into the top three for a very simple reason. Its super duper fun. Taking simple mechanics and using them to prompt compelling gameplay is, in my opinion, one of the most core aspects of a good game and this game pulls it off really well. At no point did I feel confused or lost while playing, and the difficulty curve feels good (for the most part, more on this later). Of course, this game also has flaws. First and foremost, it doesn't really incorporate the special rule at all, it incorporates the Squash theme with fly swatters but they don't feature heavily. Also, the timing based puzzles can easily cross the line of being "Challenging" to being "Frustrating" since the time spent eating a piece of bait and the time flies take to reach their destinations are not explicitly given to you in any way. As I said earlier, all the jam entries were fun, if yours didn't make it into the top three, don't worry. 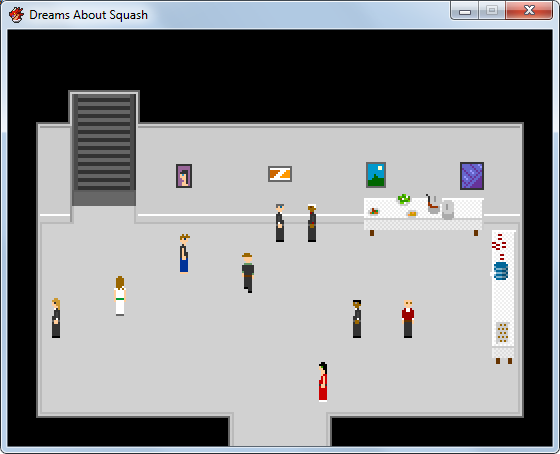 Some honorable mentions include Squash Man Run and Squash-Fire Slug Defense, which were both very fun to play as well. Now for the hard part, announcing the winner. 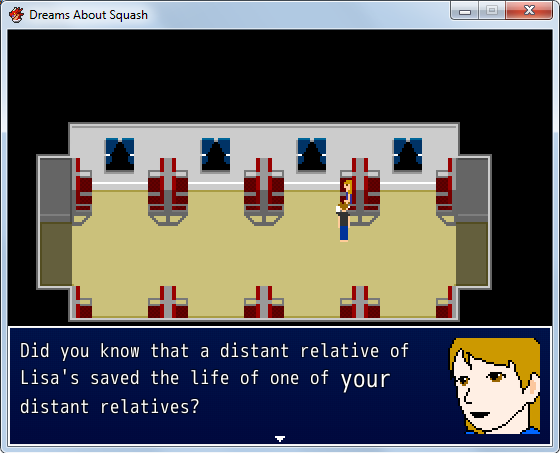 Let me reiterate that, this was a really tough decision. I have played and replayed the games to find reasons to give me a clear victory, but in the end it was still very close. Without further delay, allow me to announce the winner of The Arbitrary Gamejam #7, and host of The Arbitrary Gamejam #8! I must reiterate how close it was, Swarm was so fun that I almost gave it the win, but it just didn't incorporate the special rule or themes well enough. 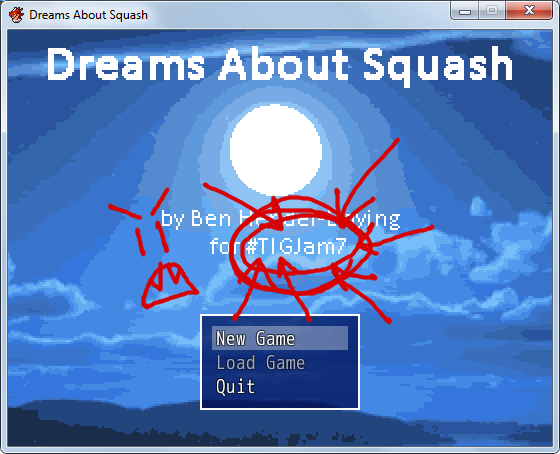 Dreams About Squash was huge, and it made me laugh out loud, but I felt that it wasn't the type of game that most people could appreciate fully. In the end the winner must be Packer. This game manages to incorporate the special rule so well that I must recognize it with victory. 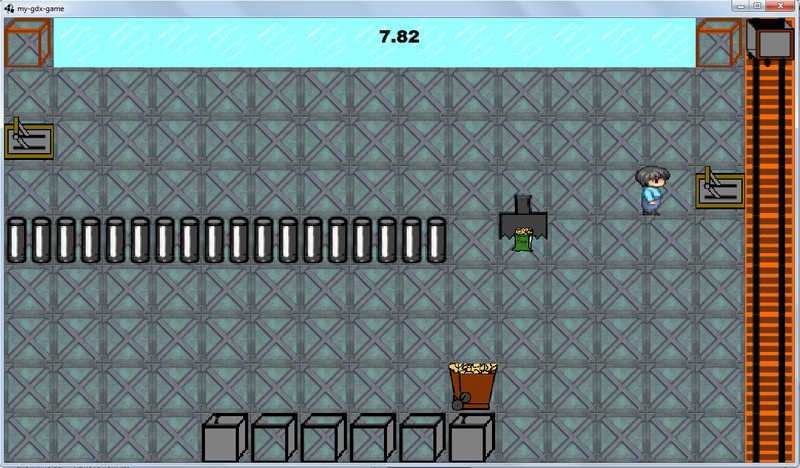 to make arrangements to host The Arbitrary Gamejam #8! If you can't host, please leave a comment below so that I can pick a new winner. Thank you to everyone who participated, and I hope to see you all on the 7th of March for #TAGJam8!